I’m increasingly dipping my big toe into the world of once a month cooking. It’s all about the slow and steady baby steps around here. I love to read about other moms successful OAMC stories. I have frozen bread, store bought milk (although we have a lovely local source for farm fresh milk now), peaches, black berries from our homegrown bushes, and cooking extras for awhile. Some months I’ve even cooked all of our meat in advance; I see a huge time and mess savings when I do this. That is what I did this past weekend, plus some additional freezer cooking. When we did our once a month grocery shopping on Friday. I bought 15 .lbs of ground turkey, 7 .lbs of sausage (don’t shoot me…it’s cheap), and 10 .lbs of chicken. I planned my May meal plan around these meats. One way that I stretch meat is by adding in beans and vegetables for additional bulk. Celery and green peppers are two of my favorite add-ins. They both go with most of the dishes that I make, or they do now since I nearly always add them. To start my meat cooking time I chopped up all the vegetables that I wanted to add to the meat. Throughout the day I kept my large skillet cranking with my ground meats and vegetables. I also started a large stock pot full of chicken to boil (you can read my post on how to boil chicken here). I cooked brown rice and beans in separate pots on the back burners too. I filled and labeled gallon freezer bags with rice, meat, and beans. Even though I did not prepare full freezer meals at this point I still have saved myself a huge amount of prep time and mess for making my meals. For example last night I made our homemade chili. I already had my meat, rice and beans cooked. It was just a matter of adding in the other canned ingredients and allowing several hours for it to simmer in the stock pot. 15. lbs of Ground Turkey::My main meat for this month. I found it 40-cents cheaper per pound than ground beef. I’m happy to report that soon we’re buying a cow! Okay, maybe not an entire cow; a friend and I are teaming up to buy our meat in advance in this healthy way. 10. lbs of Chicken::Boiled, shredded and frozen in gallon storage bags for chicken meals throughout the month. On my May Meal Plan is Chicken Alfredo, Chicken Pot Pie, and Chicken Salad. 7. lbs of Sausage::Cooked with celery, peppers and onions to add to dishes throughout the month such as homemade chili, meat loaf, and spaghetti. 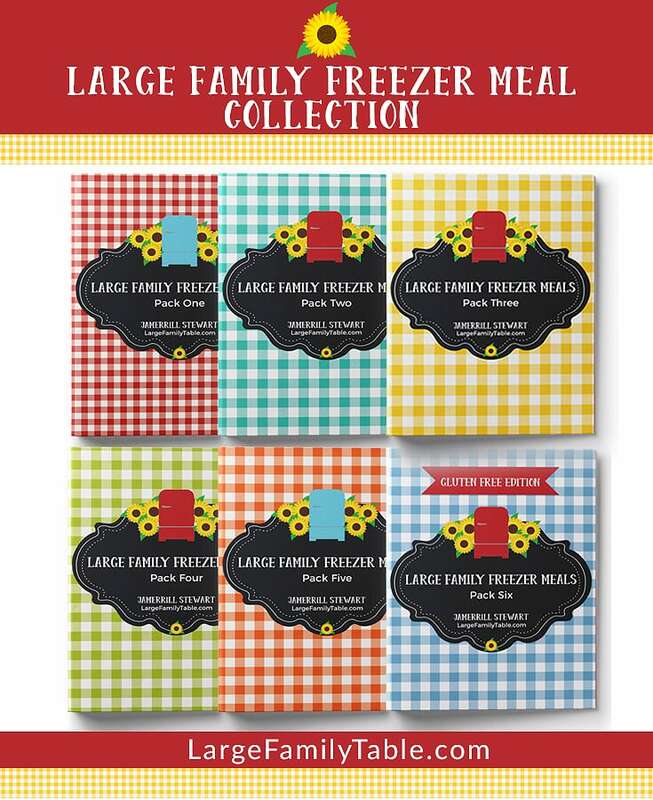 Here is my freezer cooking printable list. I hate to find a mystery bag of something from somewhere in the back of my freezer. With this list you fill out what you froze, the date, the amount and any additional reminders. After you use that item just draw a line through it on the list. Easy peasy, and helpful for my brain. Simply click the picture, download, and print off as many sheets that you need. Tell me, do you do any freezer cooking? What do you cook and freeze? Do you have any awesome freezer cooking recipes that I should try? I have always wanted to try but have just never done it. I would to know some great recipes to start with. God is amazing. This is an answer to a prayer I haven’t even prayed but obviously He knows it’s been weighing on my heart. I have two toddlers and am 6 months pregnant, and cooking has become such a chore. I used to love cooking but now it’s just so much time stuck in the kitchen when my husband would prefer me to be in the family room with them, and also getting the kids to bed earlier. The dilemma is to eat as healthily as possible which is why I cook so much. Anyway sorry for the ramble. Thank you for the great ideas. OH….wow, I love this….hmmm….now, I think I need to do it! Thank you so much for sharing! I’ve been thinking about getting into freezer cooking for a while, and this is very inspiring! I cook & freeze ground beef w/ onion & garlic & rice. I love the add celery & peppers. Thanks for the great ideas. I’m new to your site and am absolutely loving it! In fact, I have now been sitting at the computer for too long checking out all of your wonderful resources! We are a family of 7 as well so I’m excited to have found your blogs! Just downloaded this great freezer list, laminated it for easy changes and put up on the freezer with a magnetic frame from my kids art stuff !! I won’t be forgetting and ruining more food any time soon! Thank you so much! Print out and put in sheet protector. It works great. Just just dry erase markers. You can use it over and over that way.